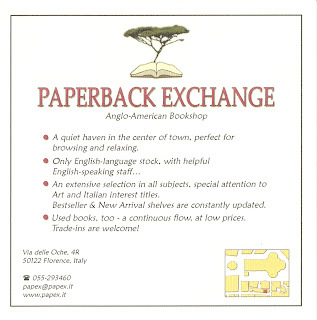 The Paperback Exchange is an Anglo-American Bookshop in the center of Florence, located at Via delle Oche, 4R (Street of Geese). When trying to look for an art history book or the latest English-language best seller, it’s easier and friendlier to shop at this bookstore. (Finding a book in Edison or someone to help you can be a frustrating experience! Though in fairness, Edison has good road maps and a decent travel section if you don’t mostly all Italian books.) The Paperback Exchange carries textbooks that are used in art history courses and these can be fun to browse through. They have both new and used books. If you are here in Florence or Italy for a period of time, picking up a copy of the classic text History of the Italian Renaissance by Hartt is probably a good idea – it’s a must - and the Paperback Exchange carries it. You could always sell it back.